A good portion of the BEA team will be at Frankfurt next week, please stop by our stand in Hall 8, Stand J37. We have beer, water and apple wine for any visitors + plus a joke or 2 to lighten your mood. NY ComicCon is next week (Oct 10-13) and they are completely sold out of 120,000 tickets - that is CRAZY! BEA is a busy show and we 'only' have 25,000 in the building. Jack that up by almost 5x and that is BUSY. 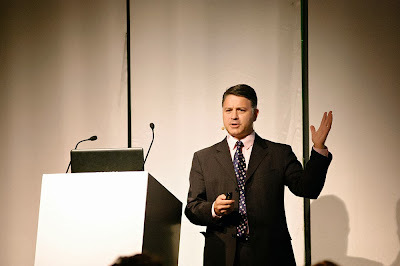 This photo was from my presentation at the Exhbitioniste program, which was organized by: www.fondazionefieramilano.it, www.regione.lombardia.it http://www.mi.camcom.it www.meetthemediaguru.org I want to thank everyone for a great program. I do look angry, but I assure you - I was anything but. Friends and Family are invited to a Celebration of Life for Dave Holton on October 20, 2013 from 4 PM to 6 PM at Jennette's Pier in Nags Head, NC. In lieu of flowers, contributions may be made to "Beyond Pink", attn: Jarie Ebert, Outer Banks Hospital, 4800 S. Croatan Hwy, Nags Head, NC 27959 or to a charity of your choice. Where in the world is Sharjah? New York, New York, Chicago, ???? ?